New research suggests that serious injuries occur as frequently in off-road motorcycle racing as they do in football, but such injuries occur less frequently in riders who wear knee braces.This may be why, although it is not well studied, knee bracing is widespread among off-road motorcycle riders. Prophylactic knee bracing (PKB) has been a controversial topic ever since the introduction of the Lenox-Hill derotational brace in 1972 at the annual meeting of the American Academy of Orthopaedic Surgeons (AAOS).1 Since then, PKB design and application have gone through a dramatic transformation.Today, more than a dozen bracing companies offer specific braces for a variety of sports. PKBs are now constructed of lighter and more durable materials, such as carbon composites, and are customizable to a player’s anatomy for individual comfort and appearance.Throughout this transition, numerous studies have been published on the efficacy of these devices in preventing knee injuries, as well as on the associated biomechanical and physiological effects.These studies have reached a range of conclusions, from finding that prophylactic bracing is protective to finding it is detrimental.Despite the numerous studies published on this topic, most have been weak in one area or another, limiting the validity of the conclusions. Prior to our 2011 study on knee injuries and the use of PKBs in off-road motorcycling,2 there had been only two large epidemiological studies on PKB use.Below, we review results from previous research and present an overview of our recent inves­tigation. Sitler et al3 published a prospective study in 1990 in which they recruited cadets from the U.S.Military Academy at West Point.The study evaluated the use of PKBs in a controlled setting with 1396 cadets participating in intramural American football.Players were randomly assigned to a braced or nonbraced group.The group wearing a PKB had a significantly lower number of overall and medial collateral ligament (MCL) knee injuries.However, their results were position-dependent: defensive players wearing a PKB had significantly less injury than those without a PKB, but the same was not true for offensive players.Anterior cruciate ligament (ACL) injuries were also reduced in the braced group, but the difference was not statistically significant. 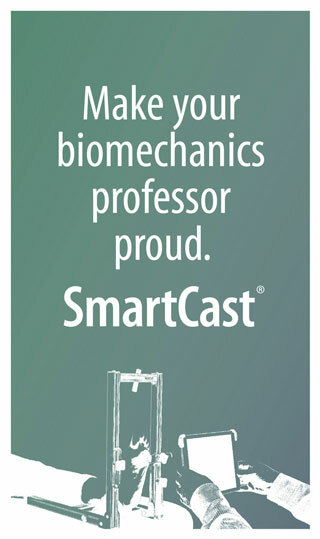 In 1994 Albright et al4,5 sampled players from the National Collegiate Athletic Association (NCAA) Football Division I Big Ten Conference.The study focused on MCL sprains resulting in more than 10 days of lost playing time in 987 voluntarily enrolled football players with healthy knees and no laxity on preparticipation physical exam.The three-year study was implemented in conjunction with the existing Big Ten Conference Sports Injury Surveillance System, allowing for standardized collection of large data sets. Investigators documented 100 MCL injuries during the study period that were eligible for inclusion in the data analysis.They stratified results into multiple categories, including practice and game sessions, position, and players versus nonplayer status (nonplayer status was defined as those who practiced with the team, but did not compete in official games).Overall injury rate trends showed a lower rate of injury to the MCL in athletes wearing a PKB than in nonbraced athletes.Despite this trend, the only statistically significant relationship showed a higher injury rate for braced nonplayers as a whole, regardless of position or session type, compared with unbraced nonplayers.The authors ultimately suggested, but could not conclude, that PKB use protects the MCL. In 2005 Najibi and Albright6 published an up-to-date comprehensive review on the use of PKBs in contact sports.This review began with the 1987 AAOS official position on PKB use, which essentially stated that PKBs could not be said to be effective in reducing the number and severity of injuries because reliable research supporting the use of knee bracing had not been conducted.Najibi and Albright6 focused on knee brace biomechanics, functional performance, and the effect of PKB use on the epidemiology of injury. Finally, based upon the studies by Sitler et al3 and Albright et al,4,5 Najibi and Albright concluded in their review that PKBs appear to be clinically effective, particularly in preventing MCL injuries, with the caveat that future research must focus on precise injury data collection, proper randomization in the study design, and specific stratification schemes (e.g., brand of brace, player position, etc.) so as not to dilute results, and therefore conclusions, about the effectiveness of specific PKB brands.Overall, Najibi and Albright6 suggested that although PKB use offered protection to the MCL in certain football players, the evidence was not substantial. 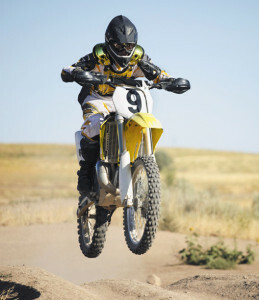 Numerous studies have been published on the effectiveness of PKBs in football, but none prior to our 2011 publication investigated their efficacy in other rigorous sports, such as off-road motorcycling, currently one of the most popular and dangerous sports worldwide.In addition, in our study a majority of one author’s patients were off-road riders, had incurred a knee injury resulting from the sport, and often inquired about the efficacy of PKB use, making the data even more pertinent.Therefore, the purpose of our investigation was to determine the types and incidence of knee injuries in off-road motorcycling as well as the efficacy of PKB use in that sport. Our recently published paper on PKB use and knee injuries in off-road motorcycling2 provides the largest epidemiological data to date on the efficacy of knee bracing and injury incidence for any sport.We evaluated more than 2300 riders from multiple countries who responded to our Internet-based questionnaire.Survey access was unrestricted and open to any who were aware of the study and were able to participate through the Internet.Participants completed an enrollment survey and subsequent weekly follow-up surveys.All participants could choose to resign from the study at any point after enrollment. The entrance survey gathered information about the rider’s demographics, experience, and other riding history.Each follow-up survey briefly assessed riding time in hours, PKB usage, and injury occurrence, along with a concise review of the initial survey.Participants were allowed to select multiple riding types, but for qualification were required to select at least one of the following: track, off-road, or MX (motocross).After evaluation, 2115 partici­pants met criteria for enrollment in the study. Participants were classified as braced by their use of a PKB at the time of injury, regardless of their usage on a regular basis.An injury was recorded only if it occurred during the one-year study period and was evaluated and confirmed by a physician.Riding-related knee injuries were defined as acute trauma to the four cardinal knee ligaments (ACL, lateral collateral [LCL], MCL, and posterior cruciate [PCL]) or osseous structures or as meniscal damage.Superficial wounds, hematomas, and ligamentous sprains without tear were excluded in the final data analysis.A rider could report multiple injuries and, additionally, could be considered to have braced and nonbraced injuries (e.g., a rider wore a brace and incurred a meniscal tear, but the following week did not wear a brace while suffering an MCL tear).Because of the variability in brace brand and model reporting, including custom-made models, injuries were not stratified in reference to particular brace design or brand. Finally, statistical analysis began with calculation of injury rates.Total absolute injury counts for each group were divided by the total absolute number of riding hours and presented as injuries per 1000 riding hours.Furthermore, an incidence (injury) rate ratio (IRR) similar to that used by Albright et al4,5 was calculated by dividing the braced injury rate by the nonbraced injury rate.Statistical significance was calculated at the p < 0.05 level for all data. 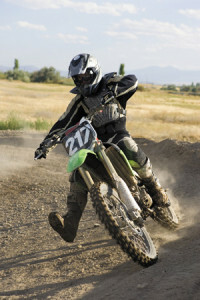 Certain intrinsic actions and maneuvers, as well as improper technique, increase off-road riders’ risk of specific knee injuries, most frequently involving the ACL, meniscus, and MCL.2,11 Commonly, these injuries occur during cornering with planting and eversion of the foot and external rotation of the tibia on the femur.In our observation, this maneuver, which is used purposely more often than not, is technically unsound.The inside leg during cornering should be extended with the foot near the front wheel as the bike is leaned over, with the foot acting as a counterbalance—without actual contact with the terrain (i.e., the foot should not touch the ground).This prevents planting of the foot and rotation of the knee.In spite of this knowledge, many riders still plant their foot during cornering, leaving them vulnerable to severe knee injury.One could speculate a variety of reasons for why a rider develops this habit or sporadically uses this maneuver, however, the end result unfortunately remains the same and involved clinicians should discourage its use. ACL injury can also occur with a hyperextension mechan­ism.11,12 When negotiating a jump, the rider’s knee can be hyperextended during impact with the landing as he or she stands on the foot peg.11 Often this occurs in the setting of an improper approach to the take off, which may be the result of poor technique in less-skilled riders (i.e., an unstable or unbalanced approach to the jump or “cross-rutting,” in which one wheel follows one path in the track while the other is in a parallel path, causing malalignment of the motorcycle).As another example, upon landing the rider may be off balance and plant one leg into the terrain in an attempt to maintain stability, thereby preventing an unintentional dismount or ejection from the motorcycle.The planted, extended leg, under high speeds, can be hyperextended, resulting in ligamentous damage.In addition to ensuring a proper lined-up approach to the take off, a correct technique should involve the rider making wheel contact with the motorcycle balanced as well as keeping this or her knees slightly bent to absorb the shock from landing. Of the 2115 total participants in our study, 1395 (65.96%) reported use of a PKB.Fifty-seven qualified riders reported having at least one knee injury, with a total of 89 injuries—43 in those who used a PKB and 46 in nonbraced riders.The highest injury incidences involved the ACL (42.7%), meniscus (lateral and/or medial, 20.22%), and MCL (14.61%).Calculated overall injury rate for the entire study population was 2.247 per 1000 riding hours.This rate is similar to that of Sitler et al3 who found a rate of 2.46 knee injuries per 1000 athlete exposures in their West Point cadet football study. With regards to previous motocross studies, none have specifically focused on knee injuries or determined an injury rate. However, there is some available knee injury data with regards to motocross.In 2004 Gobbi et al11 looked at 1870 injuries in European off-road competitions over a 12-year period.They found 7.8% (146) of the total injuries were knee ligament injuries, 27% (40) of which occurred with the use of a “special knee brace.” In 2005 Tomida et al12 reported a 9% knee injury rate in motocross, but no specifics on injury type. In our 2011 study, significant differences in injury rates, and therefore IRR, relative to brace condition were found for knee injuries overall, ACL, and MCL injuries.An IRR of less than one indicates a riding related knee injury is less likely to occur while wearing a brace than without.Overall injury IRR was 0.432 (p < 0.001), indicating a 2.3-fold increased risk of knee injury in nonbraced riders.Similarly, the IRR for ACL and MCL injuries were 0.462 (p = 0.0274) and 0.139 (p = 0.002), respectively.Therefore, the risk of ACL and MCL injury without use of a PKB is increased 2.1- and 7.1-fold, respectively. There are a few possible explanations for these results.First, most braces prevent hyperextension of the knee, one of the etiologies of ACL injuries,11,13 and a common occurrence in off-road motorcycling when riders pivot around a corner or land from a jump.Second, though there are a variety of forces at play during these maneuvers, valgus forces are minimized by the rigid structure of the brace along the lateral side (i.e., the lateral uprights), preventing MCL strains or medial joint line opening, which research has also shown predisposes individuals to ACL injuries.6 Finally, there may be a rotational component involved.As previously mentioned, external rotation of the tibia on the femur occurs during pivoting.This external rotation, while not as significant as internal rotation, is another contributor to ACL injuries,14 up to 70% of which may be prevented by certain PKBs.15,16 Due to the dynamic nature of the sport, it would be difficult to tell exactly how the PKB may be preventing knee injuries, but it is probably a combination of the above factors.Further insight into the mechanisms of injury is needed to offer more explanation on how a PKB might be protective. In our observation, the prevalence of PKB use in off-road motorcycling has increased in the past few decades as brace design and development has produced equipment tailored for the sport.We proposed that PKB use is commonplace for riders, despite the scarcity of previously available peer-reviewed data on PKB use in off-road motorcycling.Two-thirds of study participants used a PKB, supporting our theory that although not previously well-studied, PKB use is widespread in off-road motorcycling. The sport continues to grow as both a professional motorcycle racing venue and a as platform for recreational activity.The American Motorcyclist Association (AMA) had 231,874 members as of October 2010, 40% of whom were off-road/motocross recreational riders and 20% of whom were off-road/motocross racers.17 As these numbers continue to increase, the number of potential injuries will also increase, so continued investigation is certainly warranted in this athlete population. Although we hypothesized that there would be no statistically significant difference in injury rates among braced and nonbraced riders, our study data allow us to confidently reject this theory.In particular we found that a PKB provides a statistically beneficial effect for overall knee injury and also for injuries to the ACL and MCL specifically.The similarity between our overall injury rates and those of Sitler et al3 provides reasonable evidence for comparison between off-road motorcycling and contact sport knee injuries.Although there is less person-to-person contact in off-road motorcycling relative to football, our injury rates show that off-road motorcycling knee injuries, particularly those due to indirect noncontact mechanisms, are statistically just as dangerous to knee structures as a typical contact sport. The use of PKBs in sports has been controversial; however, it appears there is some evidence for prevention of MCL and possibly even ACL injuries.2-6 Despite these large studies, a blinded, randomized, large-scale investigation remains to be conducted. Future studies should include a standardized data collection system utilizing experienced medical personnel and physician evaluation.Pre-enrollment and postinjury examinations need strict consistency and precise definition of injuries to reduce inter- and intra-observer variability among large-scale populations. Ethical difficulties can potentially arise when attempting to randomize participants to a braced or nonbraced category given the evidence suggesting an increased risk of injury to nonbraced athletes.Participants may be apprehensive about completing a full football season or off-road motocross series without the use of knee injury prophylaxis.Additionally, double blinding is inherently impossible, but blinding of the examiners would be feasible and an acceptable substitute.Along with these ideas, some of the large sample sizes and data collection methods from previous studies can provide a solid foundation for future research. 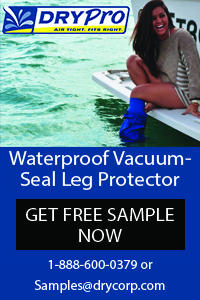 Although there have been reported negative effects from PKB use, including discomfort and the perception of decreased performance, the potential benefits of wearing these devices include MCL protection and at least some ACL protection.An MCL injury destabilizes the knee, increasing the likelihood of incurring an ACL tear.18 If a PKB can have a protective effect on MCL injury, it may also significantly reduce future or concurrent ACL injury by stabilizing the medial compartment. In our opinion, the existing data should not deter a patient from using a PKB in off-road motorcycling and contact sports.The evidence thus far suggests that the benefits of using a PKB in rigorous recreational activities outweigh the risks.It was our goal to bring attention to the PKB controversy in sports while providing reliable evidence to accurately educate our patients, colleagues, and allied healthcare providers. Wesley Gladin, BS, is a senior medical student at Nova Southeastern University College of Osteopathic Medicine, Fort Lauderdale, FL.Robert Cates, BA, is a third-year medical student at the Texas College of Osteopathic Medicine, Fort Worth, TX.Both are pursuing residencies in orthopedic surgery.Mark Sanders, MD, FACS, is an orthopaedic surgeon with subspecialty certification in orthopaedic sports medicine, practicing in Houston, TX. 1. Nicholas JA. Bracing the anterior cruciate ligament deficient knee using the Lenox Hill derotation brace. Clin Orthop Relat Res 1983;(172):137-142. 2. Sanders MS, Cates RA, Baker MD, et al. Knee injuries and the use of prophylactic knee bracing in off-road motorcycling: results of a large-scale epidemiological study. Am J Sports Med 2011;39(7):1395-1400. 3. Sitler M, Ryan J, Hopkinson W, et al. The efficacy of a prophylactic knee brace to reduce knee injuries in football. A prospective, randomized study at West Point. Am J Sports Med 1990;18(3):310-315. 4. Albright JP, Powell JW, Smith W, et al. Medial collateral ligament knee sprains in college football. Effectiveness of preventive braces. Am J Sports Med 1994;22(1):12-18. 5. Albright JP, Powell JW, Smith W, et al. Medial collateral ligament knee sprains in college football. Brace wear preferences and injury risk. Am J Sports Med 1994;22(1):2-11. 6. Najibi S, Albright JP. The use of knee braces, part 1: Prophylactic knee braces in contact sports. Am J Sports Med 2005;33(4):602-611. 7. Brown TD, Van Hoeck JE, Brand RA. Laboratory evaluation of prophylactic knee brace performance under dynamic valgus loading using a surrogate leg model. Clin Sports Med 1990;9(4):751-762. 8. Daley BJ, Ralston JL, Brown TD, Brand RA. A parametric design evaluation of lateral prophylactic knee braces. J Biomech Eng 1993;115(2):131-136. 9. Greene DL, Hamson KR, Bay RC, Bryce CD. Effects of protective knee bracing on speed and agility. Am J Sports Med 2000;28(4):453-459. 10. Rishiraj N, Taunton J, Lloyd-Smith R, et al. Effect of functional knee brace use on acceleration, agility, leg power and speed performance in healthy athletes. Br J Sports Med 2011;45(15):1230-1237. 11. Gobbi A, Tuy B, Panuncialman I. The incidence of motocross injuries: a 12-year investigation. Knee Surg Sports Traumatol Arthrosc 2004;12(6):574-580. 12. Tomida Y, Hirata H, Fukuda A, et al. Injuries in elite motorcycle racing in Japan. Br J Sports Med 2005;39(8):508-511. 13. Boden BP, Dean GS, Feagin JA Jr, Garrett WE Jr. Mechanisms of anterior cruciate ligament injury. Orthopedics 2000;23(6):573-578. 14. Shimokochi Y, Shultz SJ. Mechanisms of noncontact anterior cruciate ligament injury. J Athl Train 2008;43(4):396-408. 15. Giotis D, Tsiaras V, Ristanis S, et al. 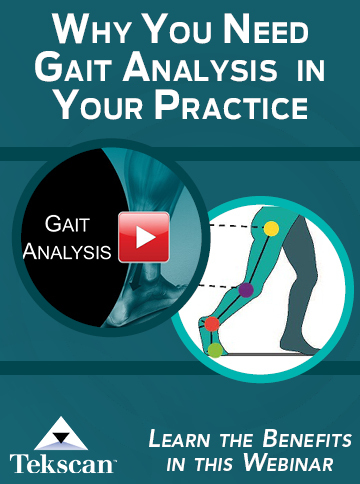 Knee braces can decrease tibial rotation during pivoting that occurs in high demanding activities. Knee Surg Sports Traumatol Arthrosc 2011;19(8):1347-1354. 16. Tegner Y, Pettersson G, Lysholm J, Gillquist J. The effect of derotation braces on knee motion. Acta Orthop Scand 1988;59(3):284-287. 17. American Motorcyclist Association. Available at www.americanmotorcyclist.com. Accessed December 30, 2011. 18. Mazzocca AD, Nissen CW, Geary M, Adams DJ. Valgus medial collateral ligament rupture causes concomitant loading and damage of the anterior cruciate ligament J Knee Surg 2003;16(3):148-151.